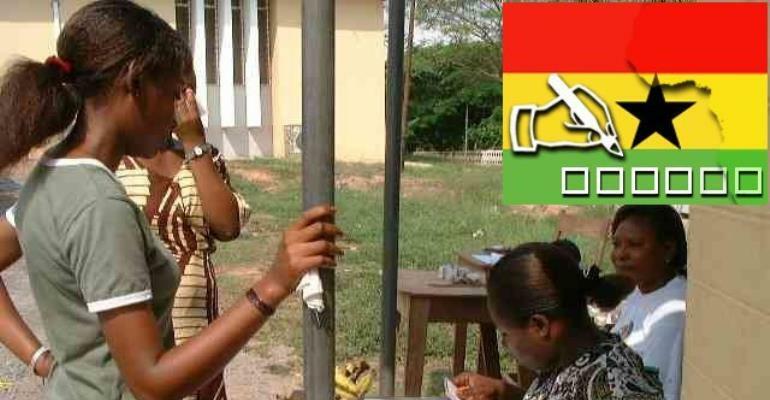 Credible reports reaching the Political Desk of The Daily Dispatch as at last Friday, indicates that a total of 216,279 potential voters who registered in the Volta and Ashanti Regions did not complete the process of becoming registered voters when they failed to turn up to take part in the last stage of the process – taking photos. Detail of six regions available indicates that apart from one, the remaining five recorded tens of thousand of people not turning up. 118,667 people did not turn up in the Ashanti Region whilst 97,612 did not turn up in the Volta Region. An analysis of the Volta; Ashanti; Northern; Eastern; Brong Ahafo and Upper East Regions' data indicates that a total of 417,143 people did not turn up to take the photos to enable them become full fledged voters. The Upper East had the lowest number of no-shows – only 4,186. The Eastern Region recorded 71,205 'no-shows': Brong Ahafo Region – 66,106 and Northern Region – 59,367. A couple of constituencies had some notable 'no-shows'; in the Ashanti Region, the following were noticeable – Manyhia (6.790); Oforikrom (6,905); Asewase (6,985) and Subin (5,019). In the Volta Region Central Tongu (9,127); North Dayi (7,267); North Tongu (7,549); Avenor (6,338) and Nkwanta South (6,318). Upper Manya (7,049); Akim Oda (4,552); Fanteakwa (3,897) and Akwapim South (3,738) were notable in the Eastern Region. In the Northern Region – Tamale Metropolis (i.e. Tamale North, Tamale Central and Tamale South) – 6,613; Bimbilla (5,825); Bunkpurugu/Yanyo (5,653); Tolon/Kumbumgu (3,876); West Mamprusi (3,841) and Nalerigu/Gambaga (3,841).